Ruptured Baker's Cyst - Emmett Technique Cairns Muscular Release Therapy, Australian made. There is nothing like experiencing things for the first time and last week I had my first RUPTURED BAKER’S CYST client. The most stunning air hostess with one big swollen leg and one petite slender one that she had been hobbling around on for over a week. Apparently when a Bakers Cyst ruptures the lower leg swells, so originally I thought of just releasing the gastrocnemius to get the fluid up and away, but on further investigation we both realised her whole leg above the knee was really swollen too. We had a chat and decided we would do a full lymphatic drainage and throw in a few other moves along the way. I could see by the end of the treatment that the ankle looked a little smaller but there was no huge change. We booked a follow up the following week and crossed our fingers for the rapid return of her 2 slender legs again. She came back for the follow up this week and said that she went to bed the night of our treatment and when she woke up the fluid was nearly all gone and she felt terrific. She said she couldn’t believe it. The poor lady had to witness my happy dance and be subjected to an excited hug. I love my job. 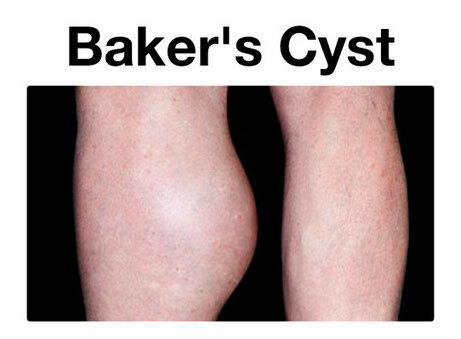 Baker's cyst is a buildup of joint fluid (synovial fluid) that forms a cyst behind the knee. A Baker's cyst is caused by swelling in the knee. The swelling is due to an increase in the fluid that lubricates the knee joint (synovial fluid). When pressure builds up, fluid bulges into the back of the knee. A large cyst may cause some discomfort or stiffness, but there are often no symptoms. There may be a painless or painful swelling behind the knee. The cyst may feel like a water-filled balloon. Sometimes, the cyst may break open (rupture), causing pain, swelling, and bruising on the back of the knee and calf. It is important to know whether pain or swelling is caused by a Baker's cyst or a blood clot. A blood clot (deep venous thrombosis) can also cause pain, swelling, and bruising on the back of the knee and calf. A blood clot may be dangerous and requires immediate medical attention. During a physical exam, the health care provider will look for a soft lump in the back of the knee. If the cyst is small, comparing the affected knee to the normal knee can be helpful. There may be a decrease in range of motion caused by pain or by the size of the cyst. In some cases there will be catching, locking, pain, or other signs and symptoms of a meniscal tear. Shining a light through the cyst (transillumination) can show that the growth is fluid filled. If the lump grows quickly, or you have night pain, severe pain, or fever, you will need more tests to make sure you do not have other types of tumors. X-rays will not show the cyst or a meniscal tear, but they will show other problems that may be present, including arthritis. MRIs can help the health care provider see the cyst and look for any meniscal injury. Often no treatment is needed. The health care provider can watch the cyst over time. If the cyst is painful, the goal of treatment is to correct the problem that is causing the cyst, such as arthritis or a meniscus tear. Sometimes, a cyst can be drained (aspirated) or, in rare cases, removed with surgery if it becomes very large or causes symptoms. The cyst has a high chance of returning if the cause is not addressed. The surgery may also damage nearby blood vessels and nerves. A Baker's cyst will not cause any long-term harm, but it can be annoying and painful. The symptoms of Baker's cysts usually come and go. Long-term disability is rare. Most people improve with time or arthroscopic surgery. Call your health care provider if you have swelling behind the knee that becomes large or painful. Pain could be a sign of infection. Huddleston JI, Goodman SB. Hip and knee pain. In: Firestein GS, Budd RC, Harris ED Jr, et al, eds. Kelley's Textbook of Rheumatology. 9th ed. Philadelphia, PA: Elsevier Saunders; 2012:chap 48. Biundo JJ. Bursitis, tendinitis, and other periarticular disorders and sports medicine. In: Goldman L, Schafer AI, eds. Goldman's Cecil Medicine. 24th ed. Philadelphia, PA: Elsevier Saunders; 2011:chap 271.